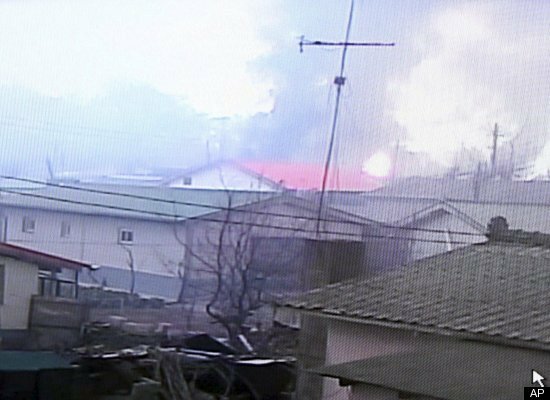 North Korea fired dozens of artillery shells onto aSouth Korean island on Tuesday, killing one person, setting homes ablaze and triggering an exchange of fire as the South's military went on top alert. In what appeared to be one of the most serious border incidents since the 1950-53 war, South Korean troops fired back with cannon, the government convened in an underground war room and "multiple" air force jets scrambled. The firing came after North Korea's disclosure of an apparently operational uranium enrichment programme -- a second potential way of building a nuclear bomb -- which is causing serious alarm for the United States and its allies. Some 50 shells landed on the South Korean border island of Yeonpyeong near the tense Yellow Sea border, damaging dozens of houses and sending plumes of thick smoke into the air, YTN television reported. One South Korean marine -- part of a contingent based permanently on the frontline island -- was killed and 13 other marines were wounded, the military said. YTN said two civilians were also hurt. "A Class-A military alert issued for battle situations was imposed immediately after shelling began," a military spokesman said. Sporadic firing by each side continued for over an hour before dying out, the military said. The shelling began at 2:34 pm (0534 GMT) after the North sent several messages protesting about South Korean naval, air force and army training exercises being staged close to the border, a presidential spokesman said. 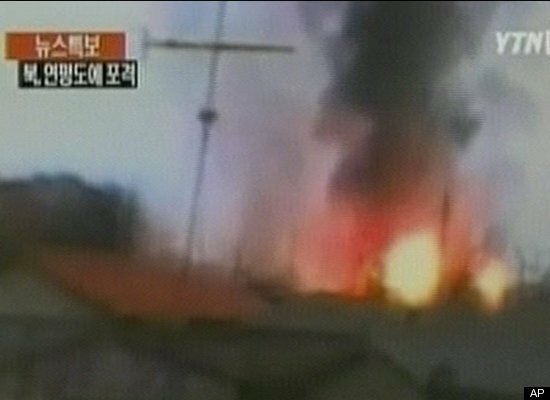 "Flashes along with a thunderous sound were seen here and there across our villages and up to 10 houses were engulfed in flames," said Woo Soo-Woo, 62, a guesthouse owner on the island. 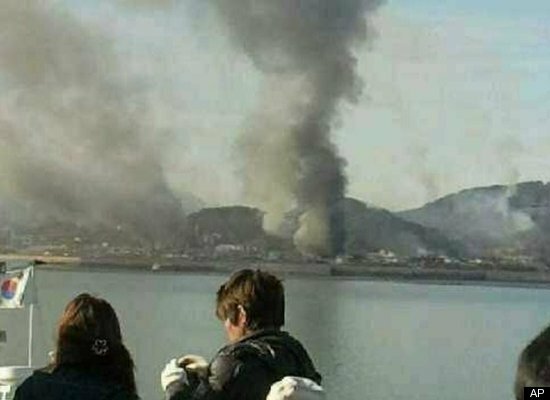 The shooting started bushfires at several places in the hills, he told AFP by phone after fleeing the island by ferry for the mainland port of Incheon. "Frightened villagers rushed to nearby shelters while others were busy running away and crowded the port to escape," Woo said, adding about 1,500-1,700 civilians live on the island. "When I walked out, the whole village was on fire," another villager was quoted by Yonhap news agency as saying. "I'm at the evacuation site with other villagers and I am scared to death." Yeonpyeong lies just south of the border declared by United Nations forces after the war, but north of the seaborder declared by Pyongyang. 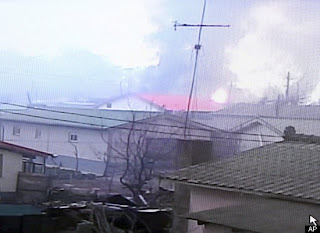 The Yellow Sea border was the scene of deadly naval clashes in 1999, 2002 and last November. South Korean President Lee Myung-Bak convened an emergency meeting of ministers and top advisers in an underground war room, a presidential spokesman said. He urged the officials "to prevent further escalation". The firing comes after Kim Jong-Un, the little-known youngest son of ailing North Korean leader Kim Jong-Il, was officially recognised as his father's eventual successor. "This is an intentional provocation to heighten cross-border tensions," Dongguk University professor Kim Yong-Hyun told AFP. "The North made a series of gestures but there has been no response from South Korea and the United States. It is now using its brinkmanship aimed at forcing Seoul and Washington to take action and agree to dialogue." Kim said the North would try to use the clash to promote solidarity among its people during the leadership succession. "It is also sending a strong message to the United States and the international community that the peninsula urgently needs a peace regime." A US special envoy headed to China Tuesday to seek its help in curbing North Korea's new nuclear project, revealed to US experts who described a sophisticated programme to enrich uranium. Stephen Bosworth has also visited South Korea and Japan this week to discuss the disclosure, which US officials say would allow the isolated North to build new atomic bombs. Bosworth, speaking in Tokyo, ruled out a resumption of stalled six-nation talks -- aimed at denuclearising the North in return for aid and other con cessions -- while work continues on the enrichment drive. China chairs the talks and is also the North's sole major ally and economic prop. It appealed for the six-party talks to resume after the new revelations, and expressed concern over Tuesday's cross-border firing. Russia also warned against an escalation of tensions on the peninsula. Ram charn teja's Orange movie Mp3 online.